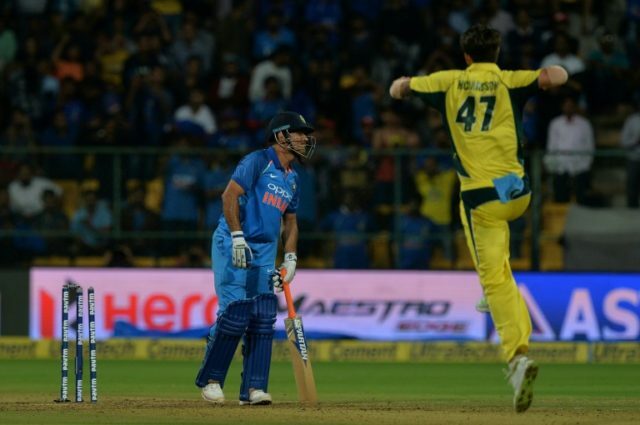 Bangalore (India) (AFP) – Opener David Warner hit a sparkling century in his 100th one-day international to help Australia down India by 21 runs and pull off a consolation win on Thursday. Warner’s blazing 124 and his 231-run opening stand with Aaron Finch, who made 94, guided the visitors to 334-5 in the fourth game of the five-match series in Bangalore. Fast bowlers Kane Richardson and Nathan Coulter-Nile shared five wickets between them to snap India’s winning streak of nine ODI games. Virat Kohli’s India began its reply on a positive note as openers Rohit Sharma, who hit 65, and Ajinkya Rahane, who made 53, put together a 106-run stand. The batsman got to his milestone with a boundary off part-time spinner Jadhav, jumping for joy as the runs were marked up. He later fell to Jadhav’s off-spin and walked off to a standing ovation.